Over the last three years, suddenly and shockingly, I've developed a curiosity about the Dark-eyed Junco complex of subspecies. I'm trying to pinpoint exactly when that switch was flipped. It must of been some terrible moment of physical duress that led to reduced mental fortitude that led to deeper entrenchment into the depths of birding minutia. Ahh...got it! It most certainly had to have been that Big Sit! back in October of '09. I sat for hours by myself in the Boise foothills, in the dark, freezing to death and seeing hardly any birds. Well, except for that flock of juncos. And there was that one junco that was dark all over, not like all the rest sporting charcoal heads with shades of brown and gray. A "Slate-colored" hanging out with a bunch of "Oregon" juncos. Cool! That's when I finally appreciated a subspecies of any kind and took that giant step into BirdNerd-dom. 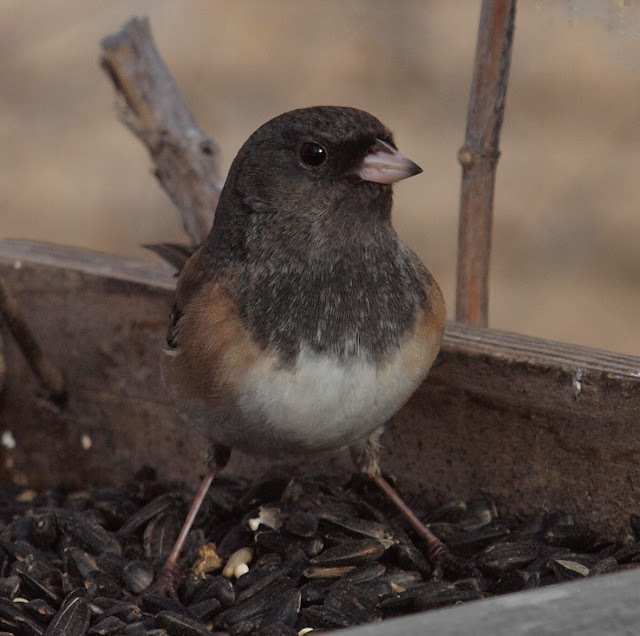 Lest I forget, my first ever sighting of a Dark-eyed Junco as a bona fide birdwatcher who cared about keeping track of such trivial things occurred at the Colcord Ridge Campground at 7600' between Payson and Heber, Arizona. It was a beautiful weekend in early May during a father-and-son campout. I had crept out of my tent before anyone else was awake to answer the call of nature. While relieving myself behind a tree, as men are accustomed to do in the woods, I spied a little bird feeding on the ground nearby, seemingly oblivious to my presence. I studied it for some time keeping detailed mental notes, then dashed for my truck and my Sibley guide. Its prominent and well-defined rust-colored mantle clinched the i.d.. A "Gray-headed" Dark-eyed Junco. So even early on in my birding life, I positively identified a subspecies. Still, it was just a junco and another new tick on my rapidly growing life list. I didn't care about what sub-group it had been assigned to. That level of detail was for the nutty birders in tweed jackets, not for me. Side note: Beyond Biology 110 and a few years of reading a lot about birds, I'm ignorant of the finer details of taxonomic classification. What in the heck is the difference, if any, between subspecies, group, complex, and race among birds? Now eBird has sightings maps viewable by subspecies, so please make an effort to enter subspecies that you can identify as it fascinates weirdos like me. NatGeo6 has awesome range maps in the back of the field guide for those birds with readily identifiable subspecies. More fuel to feed this burgeoning interest of my feeble mind. When it comes to the junco complex, pretty much all of the field guides discuss and display the junco groups. Are you like me, hopeful for future species splits and armchair ticks?! This bird really stood out from the other juncos it was with as it was much paler and the flanks much more colored. Female "Oregon" juncos are more washed out than their male companions, but this one was even lighter than the females nearby. And this junco seemed a bit extra dark, but still not as dark on the flanks as the "Slate-colored" juncos I saw back in the eastern states in late Fall of 2010. Maybe a cross between Slate-colored and Oregon? I'm still not certain on all my subspecies identification skills, but the dark lores and extensive light brown wash on the flanks lead me to think these are "Pink-sided" juncos. What do you think? I include this last photo, simply because the brown racing stripe on the head and nape were interesting. Indication of a 1st year bird perhaps? Finally, a previously posted couple of close-ups of what I consider a classic "Oregon" junco with the dark charcoal head and narrower orange-brown flank coloration. Oh, the variety of Juncos...a complex complex. Yet another reason why Birding is Fun! By the way, Dark-eyed Junco was my First-of-Year (FOY), and thus my totem bird for the year. What was yours? Very nice post Robert. I have Slate Grays in the dozens at my feeders and I am fascinated by the variation in their colors as well, and I don't think I have any subspecies, just juv. to adult male to female. The possible 1st year bird you have looks similar to the juv. females slates I see but the sides and neck don't have the color wash, mostly just the back/wings making me think for a moment, ooh a different one, but nope. Great post, Robert! Here in Ohio, Juncos indicate that winter is just around the corner, so for me that = JOY! I love snow and I love Juncos! And, at the risk of this coming off like shameless self-promotion, Kenn's new guide to Advanced Birding has a fabulous chapter on subspecies that (IMHO)does a superb job of explaining this complex and complicated topic. Great post Robert, it can be a challenge to ID subspecies. I adore Juncos and their sweet calls. Haven't had any in the yard yet but we are seriously lacking snow! gotta love those white bellies. I have noticed the feather color variation on the juncos that visit our area. They really are lovely birds. I'm seeing more of them on our country property in Indiana than ever before ... they just love those sunflower seeds. 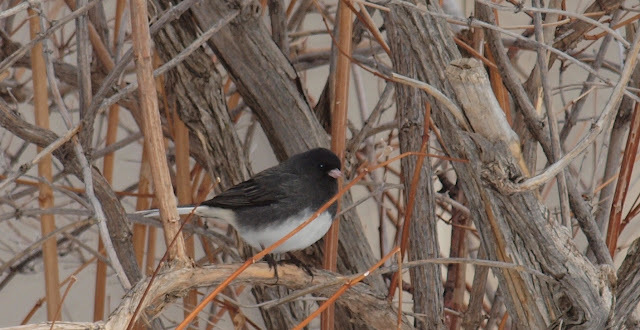 I'm happy to report that my first bird of 2012 was a junco here in Chicago. Terrific post, as always! Thanks for the nice comments everyone! I was going to do a more in depth post about how to identify junco groups and Kim, I was reading up about it in Kenn's book as a matter of fact. I quickly realized I was in over my head and figured people would have to go read what the pros wrote anyway. 1. The first photo does look to me like a Pink-sided Junco. We do get these in Utah all winter - Here in Cache County I'd guess about 1 in 50 or so is a Pink-sided, but I think some people overestimate their numbers because they can look similar to female Oregons. Size helps - in side-by-side comparisons, Pink-sideds are somewhat larger than Oregons. I think the head of Pink-sideds tends a bit more towards the bluish end of gray, and perhaps the best mark is how EXTENSIVE the pink sides are, reaching nearly to the base of the legs. 2. Although the color is a bit tough to judge in this photo, I think your second shot is a good example of a Cassiar Junco. This "subspecies" is essentially a hybrid population of Oregon and Slate-colored. A typical male has gray or strongly grayish brown (but not pure brown) sides that contrast with a blackish hood. Females are much tougher to identify. 3. The third photo looks to me like a very typical example of a Slate-colored Junco, with little to no contrast between the head and sides. They might be different tones, but they fade evenly from one tone to another, without a distinct border marking the hood. 4. The fourth photo is not an adult male, which greatly complicates identification. I'd only go so far as to say that I wouldn't rule out Oregon Junco on this one. To me, the head on that one doesn't look pale enough or bluish enough for Pink-sided, and the sides don't look bright enough. 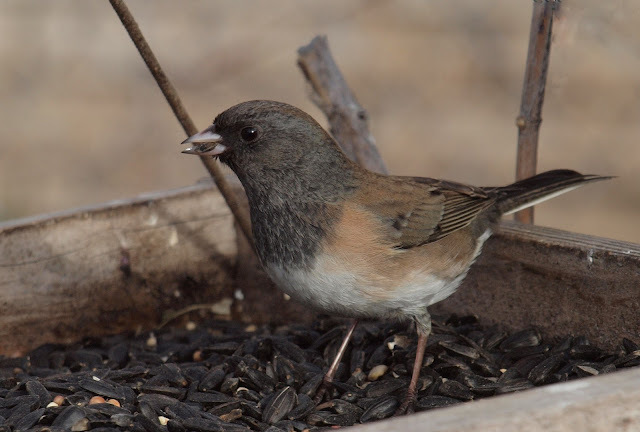 Thanks for the post: I love junco subspecies! Thanks Ryan! I appreciate your analysis. I've got a lot more studying to do. really informative! Of course, we see no juncos here in the RGV. Or at least I haven't yet. This is a weird winter, though, so who knows! Great photos and information with the Juncos. I really like the new look to the blog too. I love this post! I remember feeling a sense of loss over junco variety (and maybe even a little relief) when I moved from Montana to Maine! I am glad to know I am not alone... This very thing has driven me nuts this winter. For me it started when we had a female Oregon come by last winter. This year when I saw a few that were "off", I started searching. That's when I learned of the Cassiar Junco which added to the confusion. I've had to let some of them go, because I just cannot tell one way or another. I wish I could remember what was the very first bird I saw this year. It wasn't until a few days into January that I decided to keep a year list, a first for us. We've only done life and yard lists up to that point. It probably is a Blue Jay or House Sparrow.